Generals of Gettysburg: The Leaders of America's Greatest Battle, Larry Tagg. Brigades of Gettysburg: Union and Confederate Brigades at the Battle of Gettysburg, Bradley Gottfried. Studying for the Gettysburg Licenced Battlefield Guide Test taught me that the key to developing a tour was to understand the generals and the brigades. Both Tagg and Gottfried have provided books that are comprehensive and accurate. Nearly anyone reading a short biography of a general and then the movements of his brigade to, during and after Gettysburg will come to a new level of understanding of the process of the battle. Gettysburg Trilogy: The First Day The Second Day, Culp's Hill and Cemetery Hill, Harry Pfanz. Gettysburg: The Third Day, Jeffry Wert. Taken together Pfanz's and Wert's works provide an integrated story of the brigades and their movements in the battle. Both authors offer telling details and anecdotes that emphasize the human element on a battlefield that held over 150,000 troops. 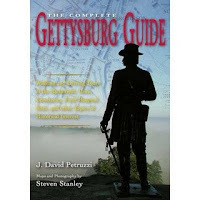 Complete Gettysburg Guide, J.D. Petruzzi. Gettysburg: A Battlefield Guide, Mark Grimsley. Petruzzi's and Grimsley' companions to touring the military park are accurate and easy to use. The Complete Gettysburg Guide has many photographs, maps, and sidebars that are vital to successful tour. It also features extensive tours of the pre-July fighting, the cavalry fights that are east, south, and west of the main battlefield, the borough, the two cemeteries, the hospital sites, and the rock carvings. Grimsley's book is clear, conscise and nearly complete with maps and tours that offer the essentials. A Strange and Blighted Land, Gregory Coco. 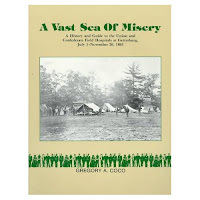 A Vast Sea of Misery: A History and Guide to the Union and Confederate Field Hospitals at Gettysburg, July 1-November 20, 1863, Gregory Coco. Retreat From Gettysburg: Lee, Logistics and the Pennsylvania Campaign, Kent Masterson Brown. Coco's and Brown's work enlarge the three day battle in a tactical, strategic and human ways. Coco's writing is wonderful and his immersion in primary sources of the civilians and the enlisted men is without parallel. Brown handles tactics and logistics quite well and offers sound insights into Lee's and Meade's leadership and the ability of their endure a rigorous and deadly campaign. This Holy Ground: A History of the Gettysburg Battlefield, Barbara Platt. Often neglected is the history of the military park, its monuments, and its interpretations. Platt's work may be close to one of a kind, having a clear focus on the acres in the park's boundaries but not becoming overwhelmed by the myths and realities of interpreting the battle. 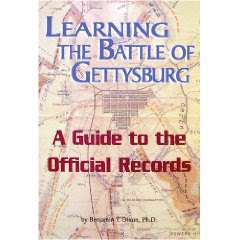 Honorable Mention: Learning the Battle of Gettysburg From the Official Records, Ben Dixon. This work clearly opens the Official Records to the layman; the 'needle in the haystack' days of the three Gettysburg volumes of the OR are over. Honorable Mention: Virtual Gettysburg, Stephen Recker. Offering a two hour audio tour of the battle, a huge photo archive of the monuments and the farms, and clear maps that show you where the tour guide is on the battlefield, Recker was achieved a remarkable and thorough presentation for use on your computer. Honorable Mention: Grappling With Death: The Second Corps Hospital at Gettysburg, Roland Maust. Maust has mined primary sources to a remarkable level in order to tell the story of one Union corps' medical staff, the civilian workers and the wounded. The agony of the July heat and humidity are told in the words and incidents of the people who were there. The heartbreaking relief of the rain and then the terror of the flood that engulfed Rock Creek leaves the reader humbled. Coddington's A Study in Command, Sears' Gettysburg, Trudeau's A Testing of Courage and Frassinito's studies of photography are all well known, have their obvious strenghts and are on most top ten lists. They are on CWL's shelves and are consulted, especially Trudeau's maps with the clocks. The list consists of CWL's favorites.